Holiday Overnight Oats are a simple to make breakfast that I totally adore! Miss Nichole from Pure Clean Fitness is here to hang out with us! I love having her visit and inspire our fitness!! Were are getting merry and bright around here this week. . . Miss Nichole’s 12 Days of Christmas + my Holiday Overnight Oats will you keep you healthy through the holidays! Just mix a hand full of fabulously-healthy ingredients together and then throw in the fridge. Let it sit there for at least a couple of hours but preferably overnight. . . and when you wake up in the morning it’s all ready to go! Holiday Overnight Oats are packed with so many super healthy ingredients . . . whole grain oats, chia seeds, dried cranberries and golden raisins, apples and oranges, pecans and pistachios! It’s an awesome breakfast or snack during the day. I love overnight oats or swiss muesli is the more accurate name for it but whatever we wanna call them, they ARE a favorite at our house! Here are a few other takes on the overnight oat: Fruit and Nut Steel Cut Oats, Lemon Coconut Overnight Oats, Swiss Muesli, Apple, Orange, and Cranberry Overnight Oats too! Miss Nichole’s 12 Days of Christmas. . . The holiday chaos is in full swing, are you sticking with your workouts? I know that there have been a couple of days when getting it in has been a a bit tricky, or I have just been too worn out to really want to try too hard. One of the things I have learned in the past is that I need to keep it fun, both for myself and with my classes. So today’s workout we are keeping in with the holiday fun and doing a 12 Days of Christmas workout. 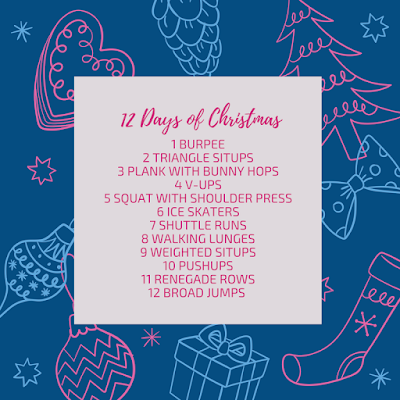 Throw on some fun Christmas workout music and have yourself a holiday workout party! Holiday Overnight Oats are a sure win for the whole family during the holidays! In a large bowl with a lid; shred pear and apple. Add milk and yogurt; gently stir to combine. Add dry ingredients; stir until incorporated. Rest Muesli in fridge for at least 1-2 hour or allow sit over night. Adjust moisture with additional milk if necessary. Serve in individual bowls and garnish with additional fruit.